At the time Meriwether Lewis and William Clark went west, the great minds of the day had already begun to ponder the origins of the Native Americans and grapple with the idea that they had originated elsewhere in the distant past. Some even believed the Indians to be the so-called “Lost Tribe of Israel.” When Lewis & Clark were assigned to collect Indian vocabularies, the intention, as Jefferson later wrote, was “to publish the whole, and leave the world to search for affinities between these and the languages of Europe and Asia.” In April 1805, Captain Lewis sent back a total of 14 Indian vocabularies he had taken in the Great Plains, and over the course of the journey through the Rockies and to the Pacific Ocean, he recorded nine more. It’s important to remember that before Lewis & Clark headed into the west, no one knew quite what they would encounter. That was the whole point of the exercise after all. So to modern eyes, some of the speculation that preceded their journey seems ludicrous today. Live mammoths wandering around the Great Plains? Not exactly. A giant mountain made of pure salt? (No, but Utah’s got a lake that fills the bill). Blue-eyed, Welsh-speaking Indians? You don’t say, Mr. Jefferson. Since the 1500s, shortly after the discovery of the New World, Welsh patriots had promoted the story that a Welsh prince named Madoc had discovered America in 1170, some three centuries before Christopher Columbus shouted Land ho. Supposedly, Madoc landed somewhere in the vicinity of present-day Mobile, Alabama. 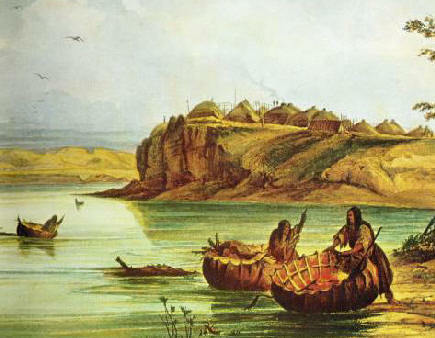 Eventually, he and his men made their way up the Missouri River where their fair-skinned descendants lived on. Even today, there are still adherents running around claiming to have proof that this or that tribe–usually the Mandans of North Dakota–are descended from the Welsh. After all, the Mandans were light-skinned and sometimes fair-haired, and they lived in large walled towns. Obviously Welsh, right? But proof via a linguistic connection proved disappointing. In 1796, the Spanish sponsored an expedition up the Missouri in order to bolster their claims to Louisiana (an incident that we enjoyed dramatizing in our novel The Fairest Portion of the Globe). One of the leaders of the expedition, John Evans, was Welsh and spoke the language; he discovered no link between Mandan and Welsh. Lewis and Clark wintered among the Mandans a decade later and documented their customs thoroughly. Like Evans, they did not believe their friends to be of Welsh descent, though Clark did later tell artist George Catlin that he would find the Mandans to be “a strange people and half white.” Though Clark probably meant that the Mandans lived a settled and highly sophisticated existence, Catlin seems to have taken him seriously. In the 1830s, when Catlin visited the Mandans and created his famous portraits and landscapes, he became convinced of their Welsh heritage, probably the last observer of any repute to promote the theory. Mandan Bull Boats and Lodges, by George Catlin (1832). 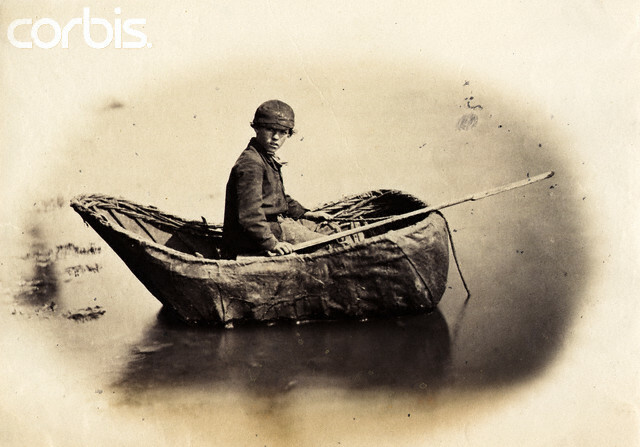 Catlin thought the boats very similar to the traditional Welsh vessels. With all due respect to any die-hard fans out there, the Welsh Indian theory eventually died out due to being utter nonsense. No historical basis for Madoc or his journey has ever been found, and no linguistic or cultural similiarities bear up to scrutiny. As for the light-complexion of the Mandans, even Catlin admitted that no more than 20% of villagers were fair — no more than the variation in complexion to be found in any ethnic group, from Viennese to Vietnamese. I loved the quote from the Nez Perce. It put me in mind of something a native Arizonan said. Being born and raised in AZ, I asked if his was a typical accent, which, basically, has nothing to distinguish it at all, and he said, “I speak American.” There you have it. Forgot to mention that I found your article to be fascinating. Being of Irish descent, I adhere to the theory that the European discovery of America was made by St. Brendan. I find Lewis’s silent treatment or silent dismissal of the Welsh Indian theory interesting. He himself was at the most a fifth generation Welsh person…I don’t remember exactly how long his family had been in America, but I know it was predominantly Welsh. LOL, I really love when people come up with the idea that someone “discovered” the lands our ancestors had always inhabited. If you ask anyone of European decent, it is ALWAYS someone from their country. I agree with James though, I believe that the Scandanavians stumbled on us first. 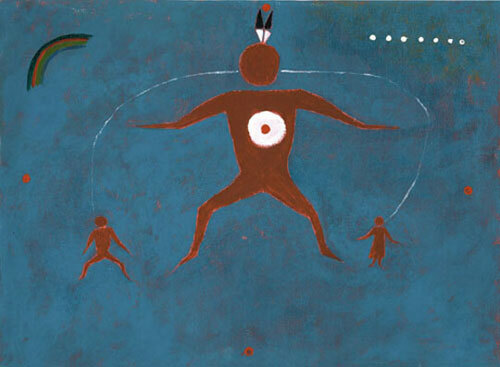 There are always stories in tribal history about some white guy or another. Except ours. Unfortunately, our first encounter with Europeans would be the Spaniards. Genocidal bunch that they were. Good read. I’ve always been interested in this story, but I weave fiction around it, because that’s what I consider it to be.